But don’t be misled into thinking that Simpson’s music is conservative or unadventurous. Starting from the legacy of Carl Nielsen (who remains one of the most underrated symphonists himself) he exploited the symphony orchestra to full advantage and developed a musical voice that offers a viable alternative to the late 20th century avant-garde. 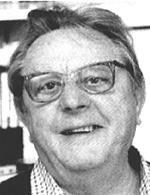 As well as the wonderful symphonies he wrote fifteen string quartets, and died in 1997 aged 76. Hyperion’s invaluable boxed set offers the eleven symphonies and the Variations on a Theme of Nielsen, with the symphonies conducted by another grossly neglected contemporary musician, Vernon Handley. Nobody should resist these classic Simpsons at budget price (around £40 - $76US for seven CDs), and kudos to Hyperion for yet once again showcasing yet another top-flight, but sorely neglected, 20th century composer. 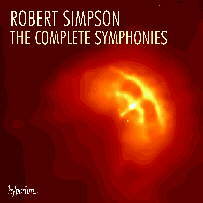 The Hyperion website has samples from Robert Simpson's Ninth Symphony. You really are a fountain of information. Thanks, I'll be checking Simpson out. Simpsons symphonies are wonderful,as are his string quartets and music for brass. The ninth symphony which could almost sound like a vast galaxy forming in the depths of space is well worth investigating.